The RESCUE NIGHT­® Liquid Melts are capsules providing flower essences in a grapeseed oil-based solution. The fast-dissolving capsules quickly release 4 drops of RESCUE NIGHT® flower essences to help you enjoy a natural night`s sleep. RESCUE NIGHT® combines the five original flower essences discovered by Dr. Bach plus the Bach essence White Chestnut, which has been used to help switch off the mind from unwanted repetitive thoughts. Alcohol free, non-drowsy and suitable for all the family. Vegetable carrier oil (grapeseed oil), capsule shell (fish gelatin, pectin, coconut oil and carnauba wax), natural flavouring (orange oil and vanilla), bulking agent (sorbitol), flower essences (Helianthemum nummularium, Clematis vitalba, Impatiens glandulifera, Prunus cerasifera, Ornithogalum umbellatum [RESCUE®] and Aesculus hippcastanum). 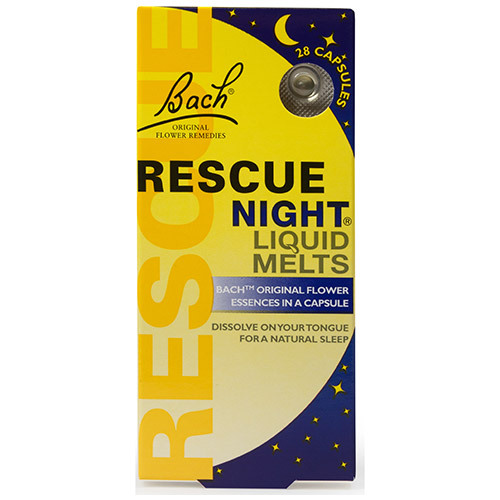 Place a RESCUE NIGHT® Liquid Melt capsule on your tongue and let it melt when your mind won`t switch off from repetitive thoughts. Below are reviews of Bach RESCUE NIGHT Liquid Melts - 28 Capsules by bodykind customers. If you have tried this product we'd love to hear what you think so please leave a review.